Well, ever since making our vegan steak I have been thinking of other uses for that homemade seitan! And what better place to put strips of seitan than in a vegan shawarma. Add some hummus and some tzatziki, shredded lettuce, sliced tomato and cucumber, and you have a feast. A shawarma is basically a meat sandwich or wrap. So using some homemade vegan meat seemed like a good idea to me! Usually you would make a shawarma in a pita bread, but honestly the ones we get here are so small, I am not a big fan, you can hardly fit anything in them! So I used wheat tortillas for the wraps, but you could use pita breads or flat breads. 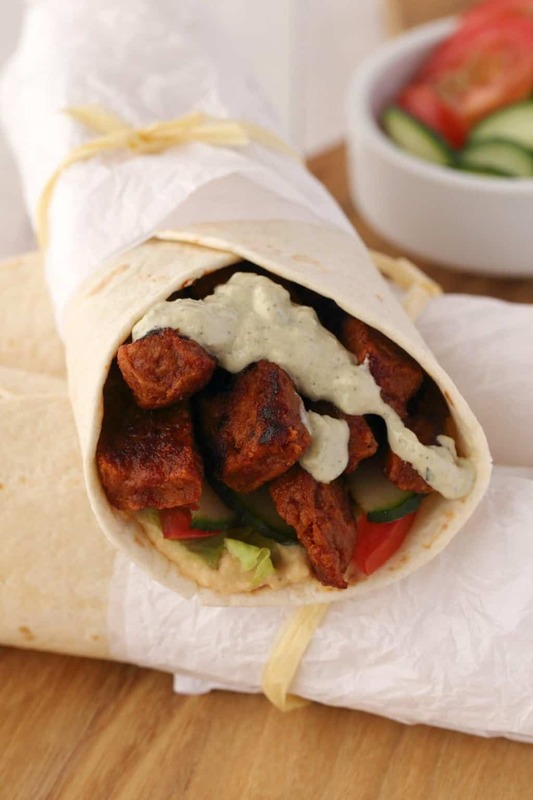 Making these vegan shawarmas starts off with making the seitan. 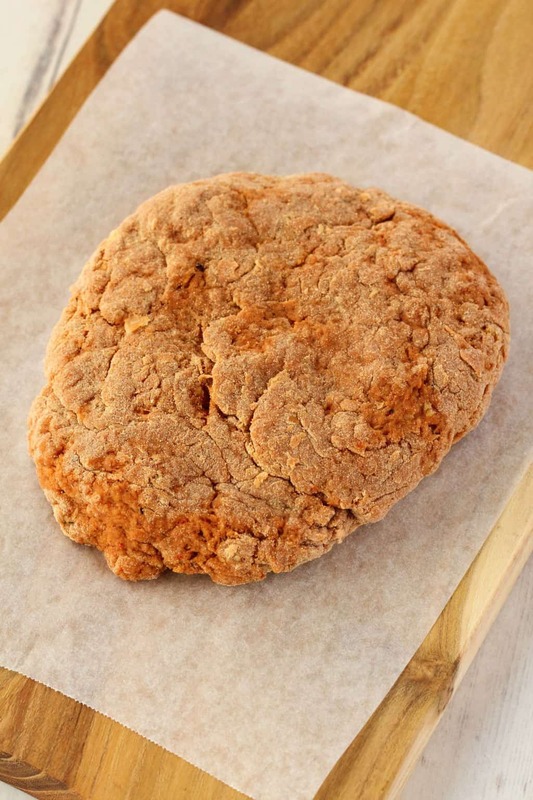 We used much the same method as we used for making the vegan steaks, but this time I kneaded it for even less time, to get a really soft texture for the seitan strips. I also used half the amount as I used for the vegan steaks, because I didn’t want to have too large a portion of seitan since it’s going in a wrap with lots of other things. So you start off by adding some chickpeas, tomato paste, vegetable stock and spices to a food processor and processing. Then you transfer that to a mixing bowl and add in some vital wheat gluten. 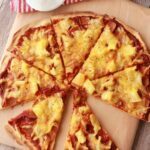 You might have to order it, or you might be able to get it from a health food store or a Whole Foods if you have one near you. 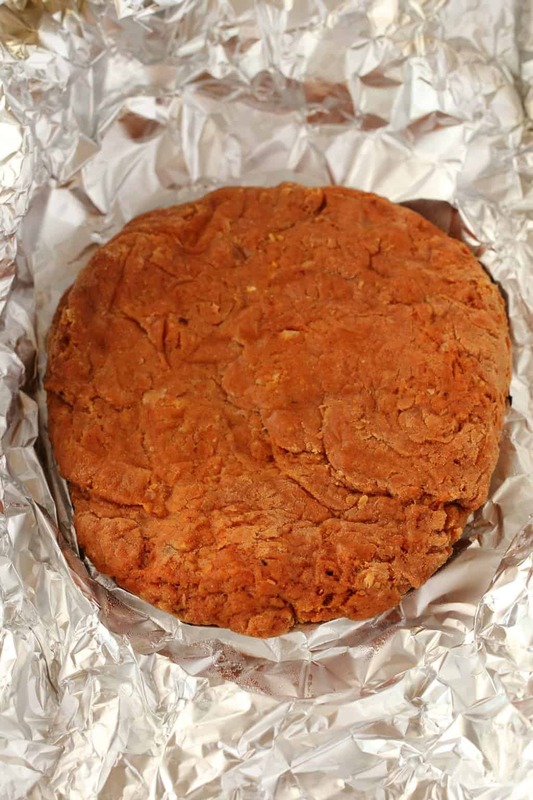 It’s basically pure gluten powder, super high in protein (75g protein per 100g of vital wheat gluten) and is the core ingredient in seitan, also known as ‘wheat meat’. Stir it in briefly and then get in there with your hands and knead it – briefly – until you end up with a nice piece of dough like you see below. I kneaded this just a few times, just until the dough stopped being sticky and started to firm up. Pat it down into a sort of ‘steak’ shape. 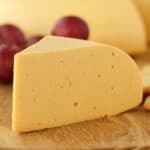 Then you wrap it in tinfoil and steam it for 20 minutes in a steamer basket placed over a pot of boiling water or in any kind of steamer that you have. After taking it out of the steamer and unwrapping from the tinfoil, you just cut it into strips and add to a frying pan with some marinade sauce consisting of soy sauce, paprika, maple syrup, tomato paste, olive oil and a little liquid smoke. Fry it up in the marinade sauce turning regularly until the outside is crispy and browned. 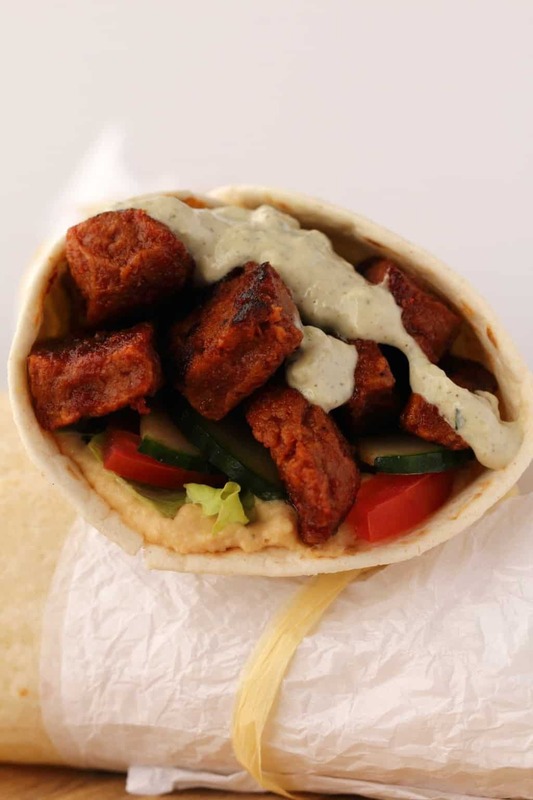 The seitan meat will be wonderfully tender and perfect for your shawarma! Serve it in a wrap or pita bread with some spicy hummus, shredded lettuce, tomato, cucumber and some vegan tzatziki over the top! 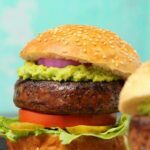 Most of the ingredients for this can be made in advance and the vegan shawarmas assembled when you’re ready. 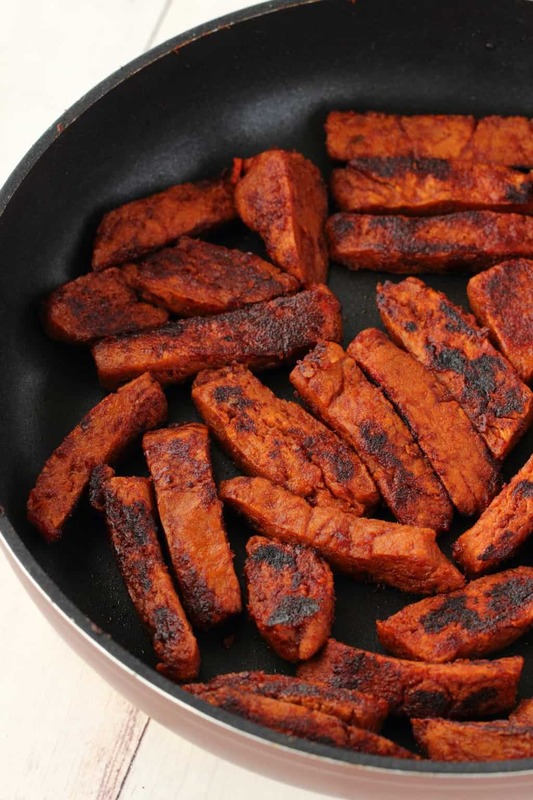 The seitan can be made up to the steaming stage and then after steaming you could cut into strips and place into a container in the fridge where it can stay for 3-4 days until you’re ready to fry it in the marinade sauce. 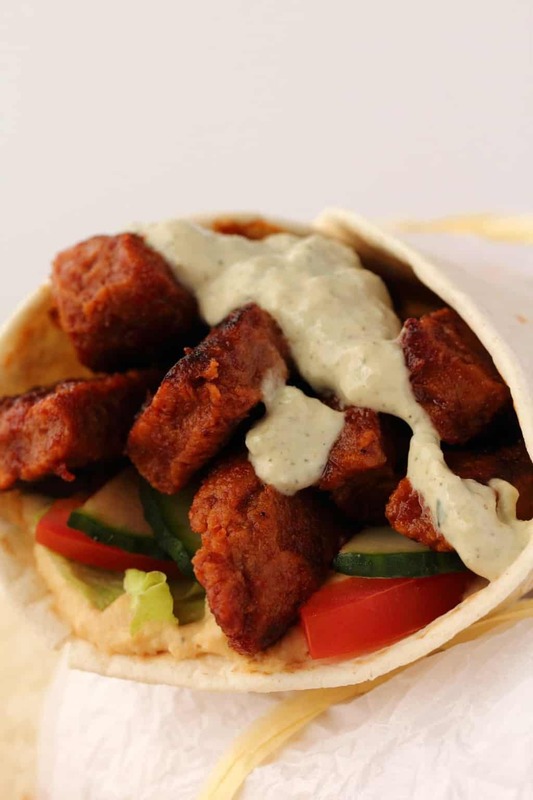 The tzatziki and hummus can be made in advance and then when you’re ready, fry up the seitan strips, and assemble your vegan shawarma. 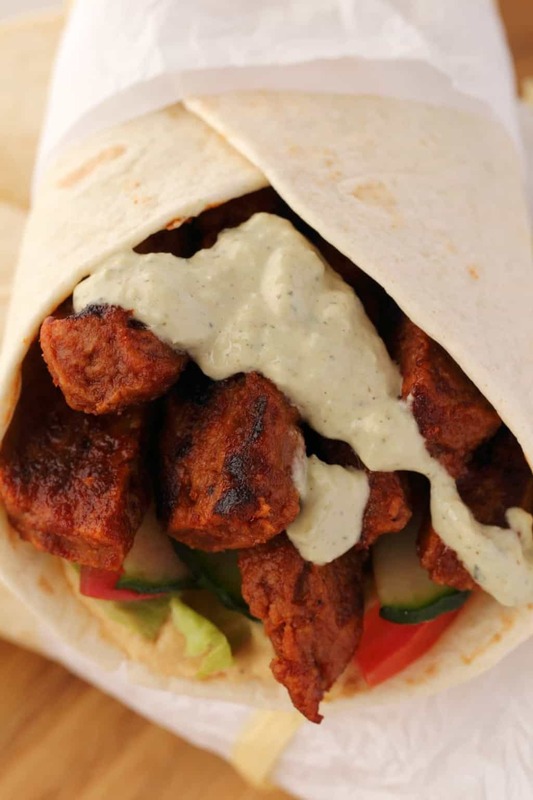 So what do you think of this vegan shawarma recipe? 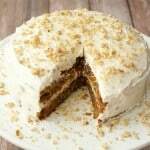 Let me know in the comments and please rate the recipe too. Thanks! 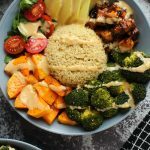 Sign up to our email list for an awesome free dinner recipes ebook and to stay updated with all our latest recipes posted to the blog. Hearty and filling vegan shawarma stuffed with homemade seitan strips, veggies, hummus and vegan tzatziki. A deliciously satisfying plant-based meal. 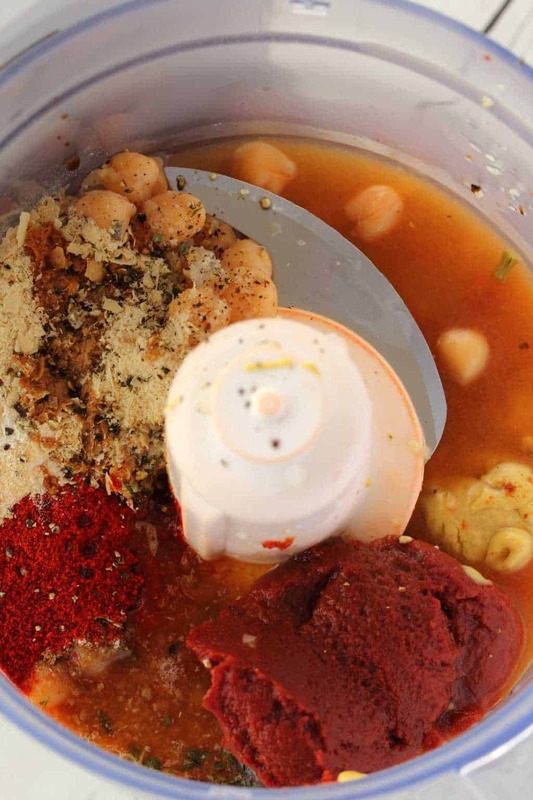 Add the chickpeas, nutritional yeast, garlic powder, onion powder, cumin, coriander powder, oregano, soy sauce, tomato paste, paprika, black pepper, vegetable stock, dijon mustard and liquid smoke to the food processor and process until well mixed. 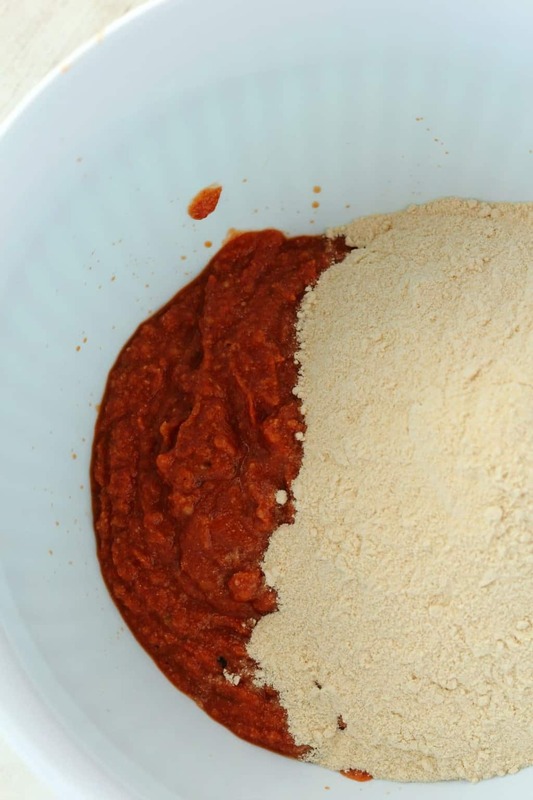 Transfer to a mixing bowl and add the vital wheat gluten. Stir in briefly and then get in there with your hands, kneading it a few times in your hands until it goes from soft and sticky until it’s just starting to get firm. Flatten it on a work surface and pat it down into the shape of a large steak. 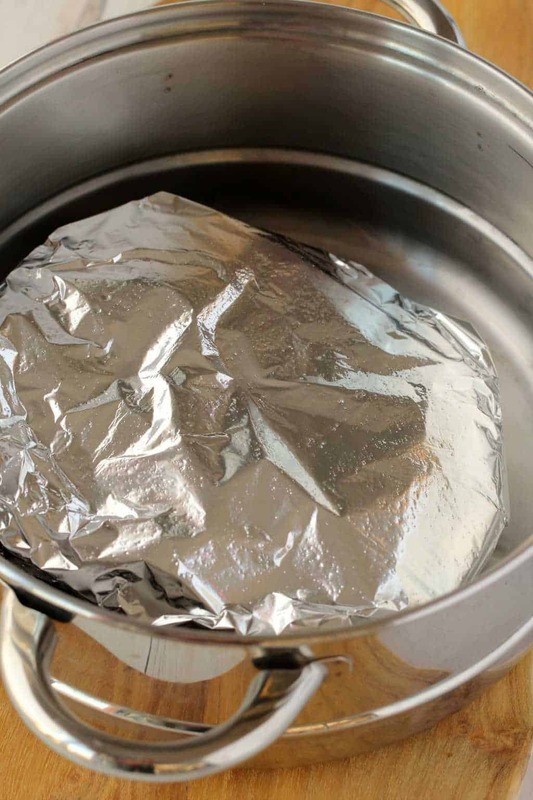 Wrap it in tinfoil (not too tight as it needs room to expand) and place into a steamer basket over a pot of boiling water (or in any kind of steamer that you have) to steam for 20 minutes. While the seitan is steaming, make up your hummus and tzatziki. After steaming, remove from the tinfoil (be careful not to burn yourself) and then cut it into strips and place into a frying pan. 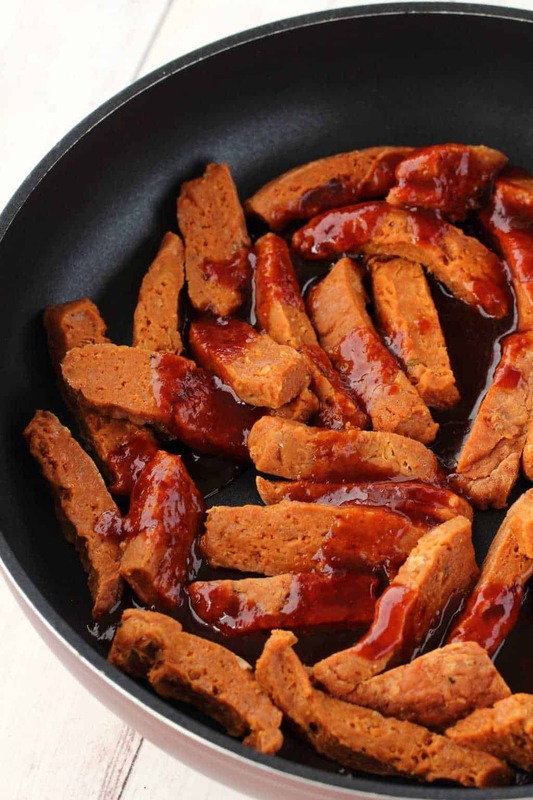 Mix up the soy sauce, paprika, maple syrup, tomato paste and olive oil for your marinade and pour it over the seitan strips. Fry the seitan in the marinade, turning over regularly, until all the pieces are nicely charred and crispy on the outside. 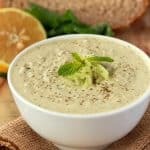 Spread some spicy hummus (recipe linked above) to a pita bread or wrap. 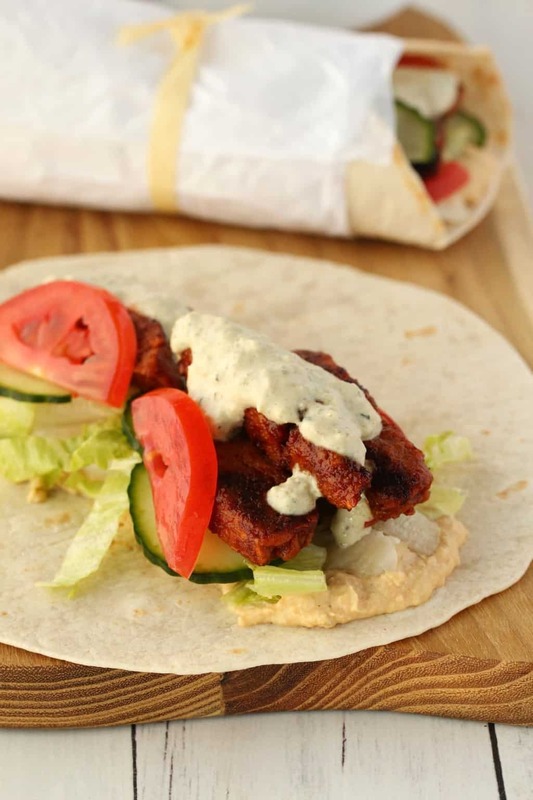 Add shredded lettuce and sliced cucumber and tomato into a wrap, top with a few seitan strips and finish with a dollop of vegan tzatziki (recipe linked above). Repeat for the rest of the shawarmas and serve! 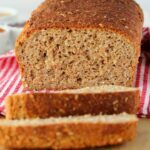 *Weigh your wheat gluten to be really accurate with this recipe. *If you want to prepare certain elements for this meal in advance you can do so. The seitan can be prepared up until the point it has come out of the steamer. Then you can cut it into strips and place into a sealed container in the fridge for 3-4 days before bringing it out and frying it up with the marinade sauce. The hummus and tzatziki can be made in advance and kept in the fridge for a couple of days. 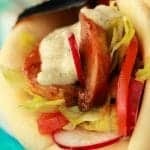 *If you make a full batch of hummus and tzatziki (as per the linked recipes) you’ll probably only use around half of each for these shawarmas. So you can either keep the leftovers for a second batch of shawarmas or just use them for other things (as spreads or dips is a good plan!) and they will keep for a few days in the fridge. 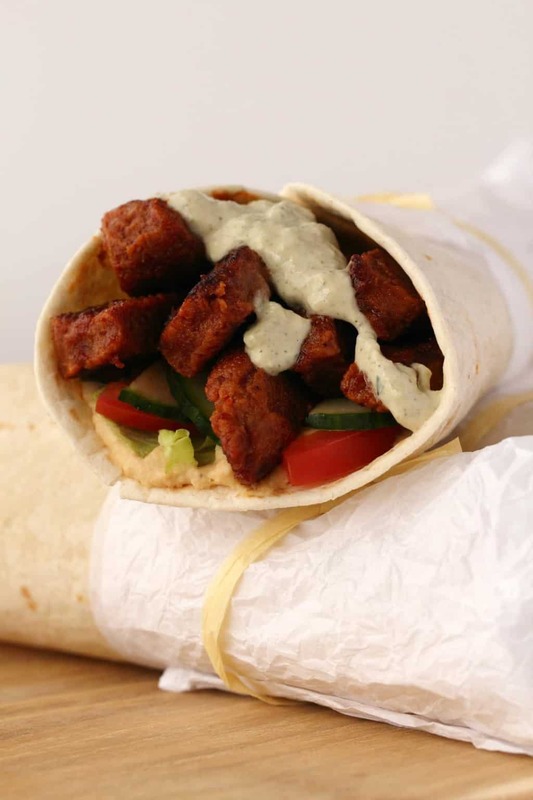 *Nutritional information assumes a half batch of homemade hummus and tzatziki was used in these shawarmas, along with all the seitan, the salad and the 6 wraps. 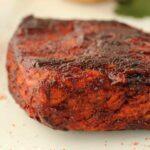 Vegan Steak – Tender, Juicy and Flavorful! Previous Post: « Vegan Chocolate Chip Muffins – Moist and Rich! I would make the argument that, not only CAN you make the seitan ahead, but you should! The loaf, left in foil in the fridge over night (or for a few hours ahead, at least) will firm up and be nicer to cook with than freshly made. One word: delicious! I just used pita breads and added some olive oil to my hummus. a real success! Seitan is just right, a nice surprise! 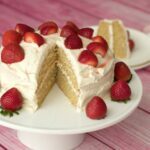 I make this all the time ! I recently bought some seitan from the store and I’ve been excited to try it, as I’ve never cooked it before. I was wondering if I’d be able to use that, instead of making it, and just start with steaming or if you would suggest kneading it first? I’m sure making it from stretch would be better, but since I already bought some, figured I’d try that first. Oh my. This was yummy. Although I found that it was necessary to fry the seitan and marinade. Just pop the two into a container, give it a good stir and let the marinade perinate and soak into the seitan for a few hours before eating.